As you already know, it is no a mystery that the favorite circuit to reach Machu Picchu is the famous Inca Trail to Machu Picchu, which attracts thousands of visitors a year due to the combination of wonderful landscapes and spectacular ruins. But Did you know]?? there is another hidden path, which shows an unknown face of the area, making its way through mountains, snow-capped mountains and lagoons. 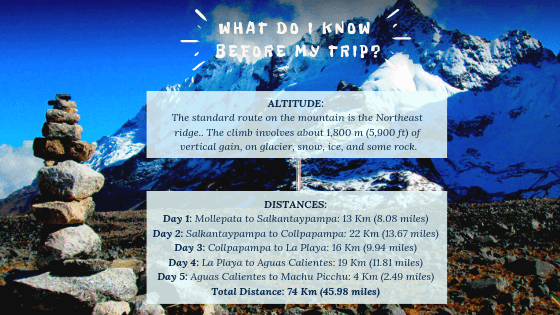 We are talking about Salkantay Trek that promises to take you through incredible landscapes and connect with the nature of the sacred mountains. Now, if you are planning to take this alternative trek, you must know everything about the trek. Thats Why Salkantay Trek Machu invites you to read more about Salkantay Trek difficulty and you must know that it depends on your level of fitness. 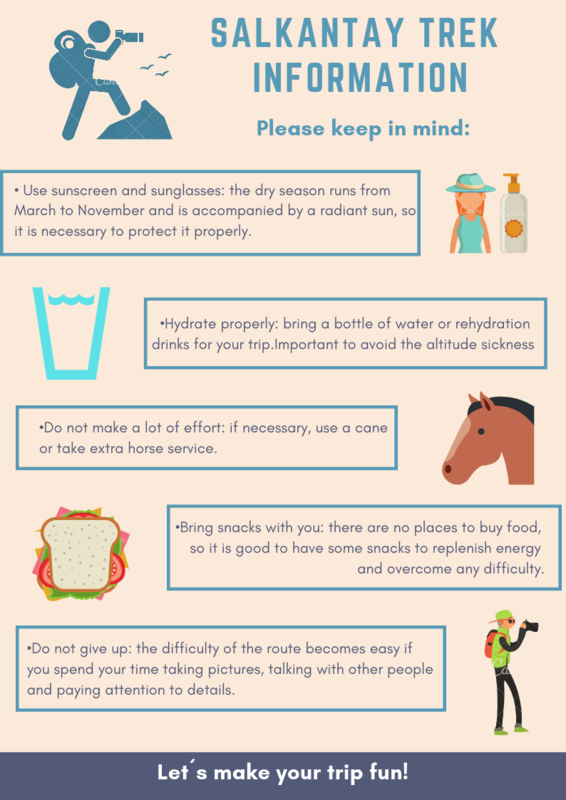 You should be well prepared and healthy prior to starting the trek. So you have to be moderately fit to complete this hike. The altitude of this mountain is higher (6,271 m.a.s.l) than others mountains in Cusco - Peru. The highest point of the trek is at 4,600 – 4,800 meters (15,100 – 15,700 ft.). Each person reacts in different ways but in general we feel the effects of elevation when we reach 10,000 – 11,000ft. The key to deal with altitude sickness is to spend 2 or 3 days before in Cusco so you get acclimatized. The first, third and fourth day is moderate trek, you will walk up and down. The second day of the trek will be the longest and hardest (18 km/11 miles). But really you will not regret. Salkantay is one of the trekking circuits that leadin the impousing inca citadel of Machu Picchu. This route covers the southern part of the Vilcabamba mountain range, showing beautiful landscapes that vary from the pampas to the jungle. Far from the agglomeration of tourists and the bureaucratic difficulties of the best known circuits, Salkantay offers privacy and authenticity to travelers who dare to make this trek. Withits different trek tours as: 4 Day Salkantay Trek or 5 day Salkantay Trek, this tour visits several Altiplano localities, as well as lagoons, hot springs and the famous Salkantay mountain. One of the main advantages of this route is that it has remained "unknown" and therefore there is no overpopulation of visitors or too much government control. So much so, that you can still make this route independently, unlike the most popular circuits. To get there it is necessary to make a trek through the Andean mountains and the plains to more than 4000 meters above sea level. This hike has a medium to medium - high difficulty due to the high altitude and longitude. People of all ages do this walk every day. Are you ready for this hike? It has a medium to medium - high difficulty and lasts about 5 days at an average rate. This walk requires a good physical condition. The route includes slightly steep ascents and plains that ascend progressively. The starting point is the Mollepata area at 2900 m.a.s.l / 9514 feet. The final point, Machu Picchu is at 2040 m.a.s.l / 6692 feet. Throughout the tour there are areas uphill and others downhill. There are no risk factors so this trek is very safe because there are signs that indicate all the way. If you need help or rest, do not hesitate to leave the road to sit down for a moment and enjoy the landscape and the fresh air of the Andes. Traditional Salkantay Trek Tours: It consist in 5 Day Salkantay Trek to Machu Picchu, where you will enjoy the real connection with nature and beauty views of the landscapes.Also you will have the opportunity to visit the impousing Humantay Lagoon with its unique color. 4 Day Salkantay Trek cheap: On this adventure, you will enjoy also the beauty of been in a natural landscapes full of flora and fauna. The unique difference is that you will enjoy everything in less time.So it is one of our best option for you if you are looking for a short trek. Also you can see our 5 Day Salkantay trek cheap, another alternative for those who doesn't have many budget. Tour Salkantay to Inca Trail Hike: For those who have more time to spend in Cusco and don't want to miss both paths. Salkantay to Inca Trail Hike turns you into the most amazing adventure through Salkantay Trek and also the original Inca Trail to Machu Picchu. Tour Luxury Salkantay Trekking: Do you want an other way of live the adventure? This is our best seller to explore the impousing Salkantay mountain.Also taking this tour, you will have the opportunity to explore the Sacred Valley of the Incas, the most important valley in the inca era. Salkantay Trek Machu is one of Peru’s leading tour operators trusted for professional, efficient, and highly friendly services. We focus on Treks and Adventure tours to Machu Picchu and also you will find some national and international tours around Peru which encourages us to polish our itinerary and improve our service continually. With a focus on discovery, cultural immersion and personal achievement, our adventure travel holidays will challenge and inspire you while you bond with other like-minded travelers who also share a love for exploring new places and cultures. We are a passionate team of travel specialists with a reputation for delivering premium travel experiences. Looking for more information? : Please visit our blogs "Salkantay Trek Advisor"